Ellie is a lab/pit mix female. She showed up at our house on January 1, 2010 as a stray. She has been a wonderful addition to our family. 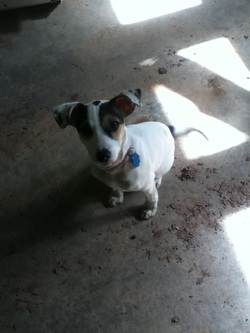 Dixie is a Jack Russell. We got her as a Christmas gift on December 24, 2012. She is a wonderful and energetic addition to our family. Fred is a beagle and we got him in September 2013. His birthday is July 4, 2013. Fred makes each and every day very interesting.